Along with the evolution of center process unit (CPU), the requirements of CPU power supply are more and more stringent. 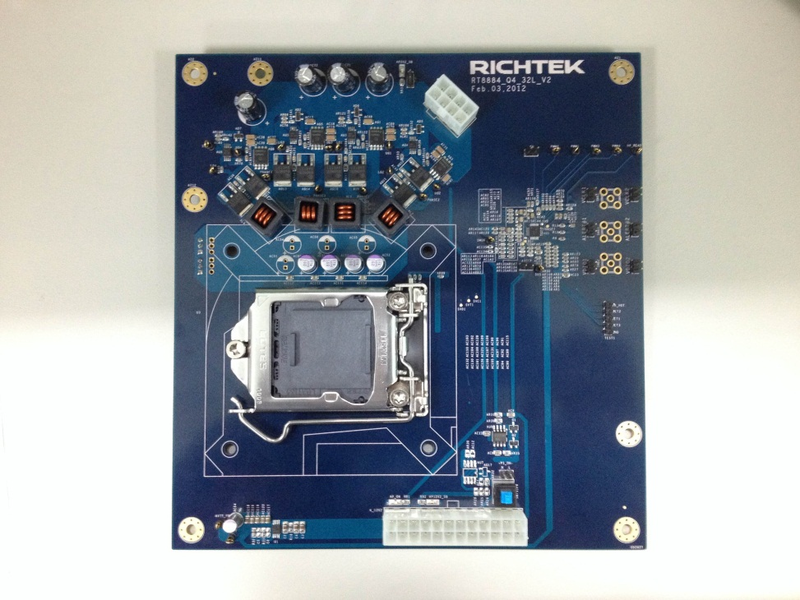 However, Richtek has early invested in CPU power supply development and has proposed numerous CPU power solutions to meet each CPU power requirements. 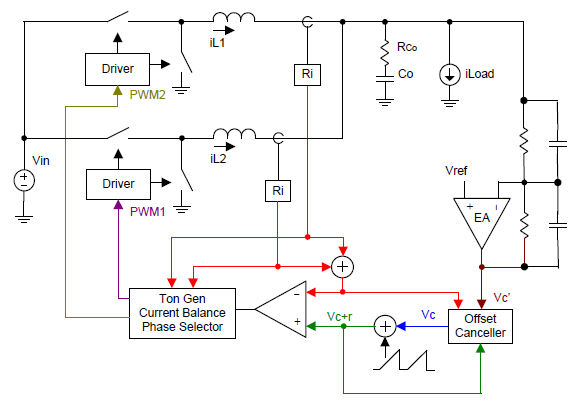 This application note introduces one of the Richtek’s patented CPU power solutions, the green-native adaptive voltage positioning (G-NAVP™) control topology. The G-NAVP™ control topology features quick response, high efficiency and can meet almost all of the CPU power specifications. Meanwhile, the G-NAVP™ control is also widely adopted as nowadays CPU power solution. The microprocessor (central processing unit : CPU) is widely used in many applications such as computer systems, embedded systems, and handheld devices. In order to enhance the performance of the microprocessor, more transistors are integrated in the microprocessor. However, the chip size is reduced due to the improvement of semiconductor manufacturing technology. The number of integrated transistors is in accordance with Moore’s Law  since the first Intel 4004 microprocessor was released at 1971. As the Dual-Core Itanium 2 Processor was released in 2006, the microprocessor has more than a billion transistors and it is about a million times more than the first Intel 4004 microprocessor . In 2011, Intel introduces a revolutionary 3-D transistor design called Tri-Gate to improve the performance and power saving capability  which is another milestone of the CPU. However, the performance of CPU is highly dependent on the voltage regulator (VR) to balance the input and consumed power. Therefore, Richtek has proposed several VR controllers to meet the specification of each CPU generation, and the following will shows the corresponding table. Microprocessors are becoming increasingly powerful. In other words, the power consumption is dramatically increasing. In order to satisfy the high current and low voltage power demand from the microprocessor, the multi-phase voltage regulator (VR) is used. Figure 1 is Richtek’s emulation board for different CPU generation. Figure 1(a) shows the picture for CPU power solution of AMD SVI2 processor, and Figure 1(b) shows the picture for CPU power solution of Intel VR12.5 processor. Figure 1. Richtek’s emulation board for different CPU generation. (a) AMD SVI2 processor. (b) Intel VR12.5 processor. Generally speaking, the interleaved multiphase synchronous Buck converter with voltage-mode control is used in VR. However, today’s VR faces stringent challenges, not only high current but also strict transient response requirements. 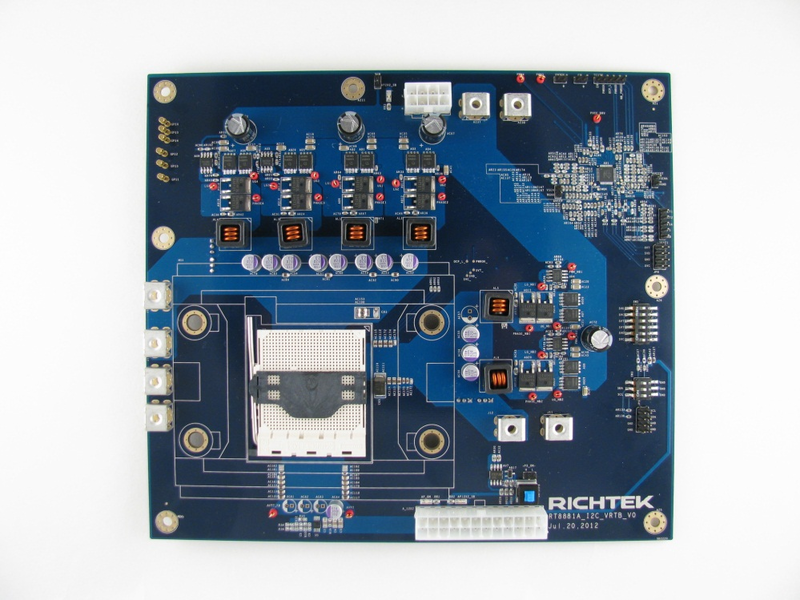 In order to get faster system and reduce the size and cost, Richtek proposes the G-NAVP™ topology for the multiphase VR. Table 1 to Table 4 shows the corresponding table between Richtek VR controllers and different CPU power specifications. The G-NAVP™ topology is one type of ripple-based constant on-time control with current ramp and AVP function. Constant on-time control features improved light-load efficiency while preserving the heavy-load efficiency to meet the more and more stringent light-load efficiency specification. The enhanced light-load efficiency greatly improves the using time of the mobile productions which is more attractive to the consumers. The AVP function is designed for the energy and BOM saving purpose, and which is also the feature imposed by the CPU chip maker such as Intel and AMD. Figure 2 shows the circuit diagram of G-NAVP™ topology. The G-NAVP™ topology is a constant on-time current-mode control with external ramp and DC offset cancellation. The error amplifier (EA) is designed to finite DC gain to adjust the AVP load-line and do the pole and zero compensation. The current signal is sensed through the DCR current sensing network and modulation with the external ramp and comp signal. The external ramp is added in the purpose to increase the noise immunity. The on-time generator will automatic change the on-time with the input and output voltage to make the inductor current ripple as constant over the entire input/output range. For more accurate output voltage, the DC offset cancellation function is added in the loop to cancel the ripple offset voltage. The functions mentioned above not only increase the robustness and accuracy of CPU controller but also maintain the good transient response performance. Figure 2. G-NAVP™ control topology circuit diagram. Constant on-time control has been widely adopted because of the faster transient response, good light-load efficiency and smaller component size. For nowadays mobile products, the longer using time is more attractive to the consumers. Therefore, the constant on-time control greatly catches designer’s eye because of the outstanding light-load efficiency. Constant on-time control is one of the variable frequency controls. 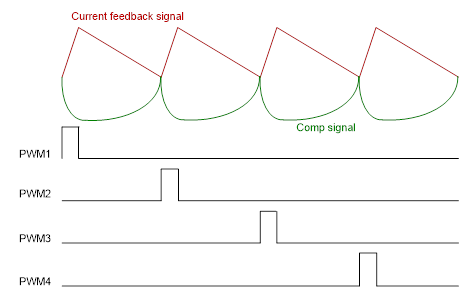 The PWM is modulated by the current feedback signal and comp signal in the continuous current mode (CCM) as shown in Figure 3. The control switch turns on when the comp signal touches the current feedback signal, and turns off after the expiration of the internal one-shot timer. Figure 3. 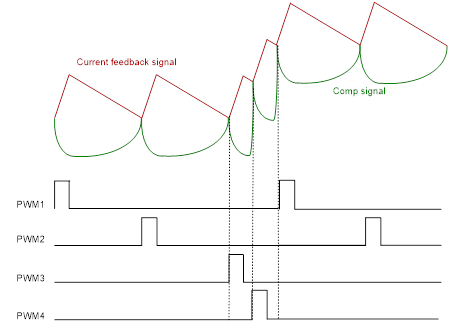 The basic G-NAVP™ modulation behavior waveforms in CCM. During the load transient period, constant on-time control automatically changes the switching frequency to speed up the transient response. For the load step-up transient, the off-time is reduced and equivalent increases the switching frequency to transfer more energy to the output load as shown in Figure 4. Moreover, for the load step-down, the off-time is increased to reduce the switching frequency and ease the overshoot phenomenon. Figure 4. G-NAVP™ modulation behaviors in load step-up condition. The main benefit of constant on-time control is light-load efficiency. The switching frequency of the constant on-time control in the discontinuous current mode (DCM) is proportional to the loading current as shown in Figure 5. At light load, the switching loss is the dominant loss, and the light-load efficiency can be improved by reduced switching frequency. In Figure 6, we can see that using constant on-time control at light load condition can achieve higher efficiency than using constant frequency control. In DCM operation, the behavior of the low-side MOSFETs needs to work like a diode, that is, the low-side MOSFETs will turn off when the inductor current reaches zero. After the low-side MOSFETs are turned off, the discharge time of output capacitors is dependent with the loading current. Capacitor discharge slope is lower than Figure 5 (b). (b) Load increased conditionCapacitor discharge slope is higher than Figure 5 (a). Figure 5. G-NAVP™ control behavior waveforms in DCM. (a) Lighter load condition. (b) Load increased condition. Figure 6. 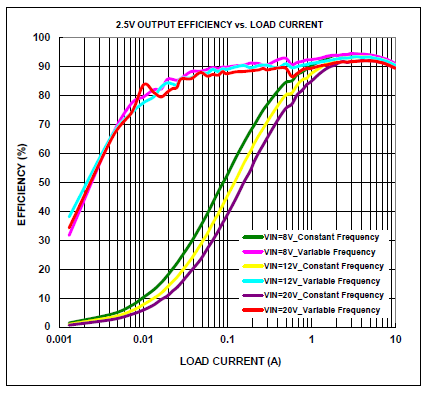 Efficiency comparison between constant frequency control and variable frequency control. Due to the inductor current ripple is proportional to the input voltage minus output voltage during the on-time period. The inductor current ripple may vary with the input voltage and output voltage, and further affect the output voltage ripple. The constant current-ripple constant on-time (CCRCOT) mechanism will sense the input and output voltage and automatically make on-time inverse proportional to the input and output voltage. With this on-time control methodology, the G-NAVP™ topology can provide superior output voltage ripple over the wide input/output operation range to pass the output ripple TOB specification and can further reduce the output capacitor size. The design trend of the consuming electronic product becomes smaller and smaller. However, the size of the power supply is usually dominated by the power stage component, such as inductors and capacitors. Furthermore, the thermal issue is more significant when the component size is minimized. In order to solve the problems above, the adaptive voltage positioning (AVP) function is proposed for the energy and BOM saving purpose. The basic idea of AVP is to control the output voltage level so that it is slightly higher than the minimum value at full load, and a little lower than the maximum value at light load. As a result, the entire voltage tolerance window can be used for the voltage jump or drop during the transient period. Figure 7 shows the transient comparison between non-AVP and AVP designs -. Therefore, the AVP design allows customers to use fewer output capacitors to reduce the VR cost. Besides, the AVP control greatly facilitates the thermal design because the VR output power at full load is degraded. To implement the AVP function, the VR output impedance needs to be designed as constant as shown in Figure 8. Figure 7. The behavior of AVP function. Figure 8. The relation between loading current and output voltage. Instead of using complicated type-3 compensator, the G-NAVP™ topology adopts a low gain compensator (one pole and one zero) and further utilize the steady-state error, which is the native of low gain compensation, to do the AVP function. For this reason, this control topology is called as native adaptive voltage position (NAVP). In the G-NAVP™ topology, the AVP function is achieved by set the load line (droop) via the current loop and the voltage loop. For user friendly purpose, Richtek provides a brief load line setting equation in corresponding specific IC datasheet. Considering the noise margin and jitter, the G-NAVP™ topology adopts a ramp compensation to increase noise immunity and reduce jitter at the switching node. Besides, with appropriate design, the ramp compensation can also smooth the mode transient behaviors. 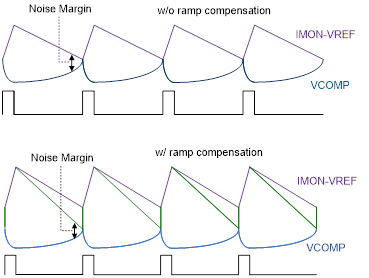 Figure 9 shows the noise margin with and without ramp compensation. Figure 9. The noise margin with and without ramp compensation. Along with the growth of the mobile productions, the efficiency catches more attentions due to the finite battery time and thermal consideration. To satisfy both the performance and efficiency requirements, Richtek provides the G-NAVP™ topology to fulfill the consumer’s requirements. The G-NAVP™ topology adopts ripple-based constant on-time control with current ramp and AVP function. Constant on-time control features quick response and high efficiency, and the AVP function provides good BOM saving capability. The offset cancellation circuit and the ramp compensation increase the DC accuracy and noise immunity. Combine with the above functions, the G-NAVP™ is an outstanding VR controller and can meet almost all of the VR power specification from Intel and AMD applications. Kaiwei Yao, Yuancheng Ren, Julu Sun, Kisun Lee, Ming Xu, Jinghai Zhou and Fred C. Lee, “Adaptive Voltage Position Design for Voltage Regulators,” IEEE APEC’04. Jian Rong Huang, Sophia Chien-Hui Wang, Chia Jung Lee, Eddie Kuo-Lung Tseng and Dan Chen, “Native AVP Control Method for Constant Output Impedance of DC Power Converters,” IEEE PESC’07.